1. You-time is crucial for your happiness (and your family's). Taking time for yourself isn't a luxury. It's a necessity. And when we actually create the space for it in our lives, it benefits not just us, but everyone around us. We can't give from an empty cup. In order to be of service to both ourselves and others, we must first be overflowing with enough energy to share. When we take the precious time out of our lives to retreat, we allow for that much-needed refilling of our cup. We step out of the "should's" and "have-to's" and invite the "could's" and "want to's". We reboot. We reconnect with the peace, joy and love that was there all the time, and we create the capacity to share it with those we love most. 2. Getting out of your routines is good for the brain. Did you know that the brain is built for repetition? Every time we see, do, say or experience the same thing, the brain creates a stronger and stronger neural pathway associated with that experience. This means that we can live our lives easily and in essence unconsciously. We don't have to remember how to get to the grocery store each and every time. The brain memorizes the path, and our body drags us along without much thought or effort. The same goes for changing the hardwired habits, beliefs and patterns etched in the brain. When we remove ourselves from the usual triggers in our day that remind us of who we are, we're able to create new patterns, new beliefs, new habits. Add in a highly-emotional, energetically-intense meditation experience over a string of happiness-fueled days, and we have the recipe for rebooting our brains and creating a completely new version of the self. BOTTOM LINE: Worst-case scenario, you come home to your old routines feeling more present, more relaxed and way more rejuvenated. Best-case (and more likely) scenario, your whole freaking life changes from the inside out. 3. The retreat community are total badass light warriors you want to call friends. Take a moment to think about all the friends you have in your life now. The work friends. The college friends. The mom friends. The neighbors. The family friends. Friends of all types are so wonderful to have, but how many of the people in your life are there because you share values and a common language of light and soul work? The community of friends you build on retreat is unlike any other. I have both experienced the camaraderie personally and watched it as a teacher facilitating others, and the way light workers hold one another is absolutely sacred. Imagine having a group of soul sisters and brothers who sat beside you in the moment of your greatest surrender, who witnessed your most intense shift, who supported you through your most powerful realizations. There isn't idle chat in these groups. It's an army of soul warriors who are ready and willing to see directly into your soul and hold space for your deepest ponderings. It's downright holy. BOTTOM LINE: You return home with a slew of new friends who "get you" (and who you can call when your people don't.) You know that's simply priceless. 4. Clarity and inspiration thrive when we create space. Know that feeling of being stuck? Of living in confusion? Of swimming in doubt and worry? Retreats are the antidote to those feelings. It's a vacation with a kick, and it's the quickest way I know of to get crystal clear on whatever is clouding your world. The truth is that we have all the answers we seek right there inside of us. It's just that we haven't been able to be quiet or still enough to realize it. When we retreat from the noise and busy-ness of our lives, we carve out the necessary space for opening all the files of genius stored right there in our own hearts and minds. The a-ha's pop like fireworks, and the inspiration pours on like syrup. I've seen it happen again and again (and again) in my own life and others'. They're called "meditation downloads," and let me tell you, it's the real deal. BOTTOM LINE: You go back to your life with a heart full of understanding that seemingly wasn't there before. I've seen people change careers, heal relationships, connect with abundance and claim their power just. like. that. 5. Self-care and pampering are part of the practice. Mastery of any activity comes when we practice, and what better way to practice loving ourselves than to carve our time with no other to-do's than to sit and be? Retreats are intentionally designed to be low-fuss and high-impact. Healthy, organic meals prepared for you three times a day. Comfy, cozy rooms cleaned and cared for with love for you. Activities and sessions designed so that all you have to do is show up and be present. It's nurturing, relaxing and incredibly rejuvenating. And who couldn't use all that? BOTTOM LINE: You get a week's worth of practicing what it feels like for life to be easy, flowing and free. And you return home armed with all sorts of loving little changes you can make to emulate that feeling in your everyday life. In case you haven't heard, joy is your birthright. We all deserve to feel good. And I'm a big believer in creating a life that makes you want to get up in the morning and live it. I have spent thousands upon thousands of dollars on meditation vacations for myself not just because they're impactful and inspirational but because they're boatloads of fun too! Who doesn't love to travel to beautiful locales, get pampered, make new friends, laugh your face off and you know, change your entire life in the process? BOTTOM LINE: Fun. Um, yes, please. COME ON RETREAT WITH ME! Want to experience the retreat magic yourself? Join me and my sister Lacy Young this October in Spain for our most advanced retreat yet to deepen your mystical prowess and create measurable, lasting change in your life. 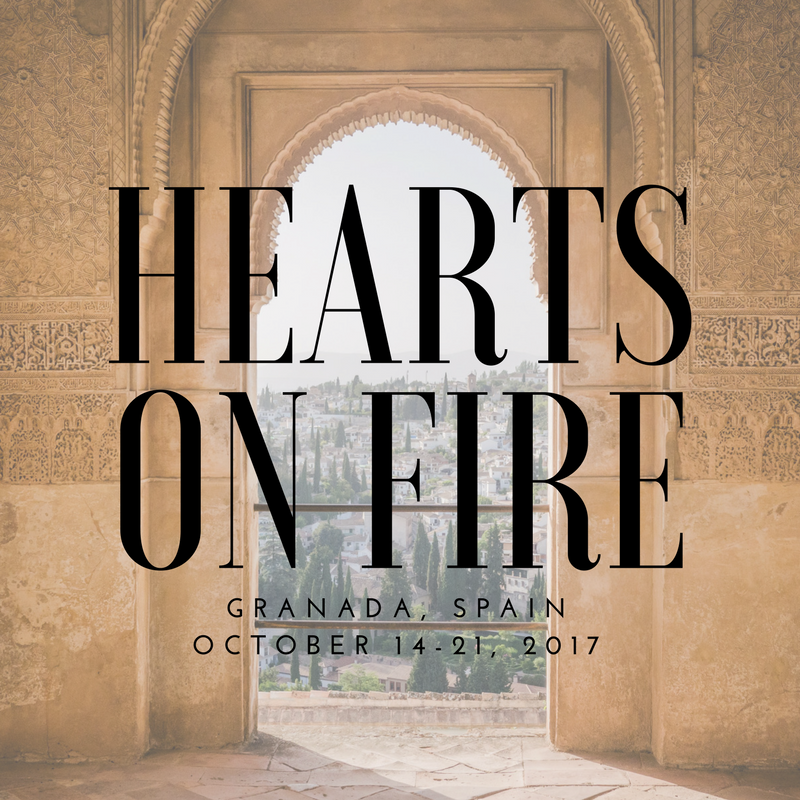 Hearts on Fire is an intensive week-long meditation retreat for the experienced spiritual seeker wanting next-level growth and mystical activation in your life.